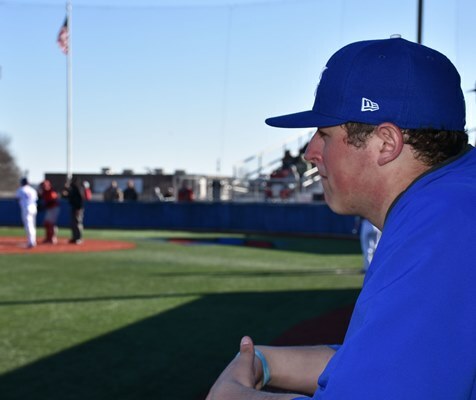 Blue Devils divide Jayhawk opener; Gacke hurls 2-hit gem, 3-0 – Welcome to Wyandotte Daily! Box scores told the story in Kansas City Kansas Community College’s split with Coffeyville in opening Jayhawk Conference play Thursday. 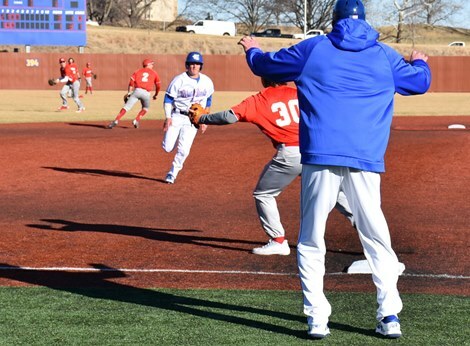 Cole Gacke walked none and the Blue Devils played errorless defense in a 3-0 opening win only to have eight bases on balls and three costly errors open the doors for an 8-3 Coffeyville win in the second game. The split sends KCKCC to Coffeyville Saturday with a 7-6 record. A sophomore righthander from Liberty, Gacke was nearly flawless in the opener, allowing two hits, striking out six and walking none. Gacke was perfect the first four innings before giving up a leadoff single in the fifth and a leadoff double in the sixth before retiring the final six Ravens in order, five on infield grounders. “My curve was good and I got a lot of misses on my change-up,” said Gacke, who needed just 77 pitches in the 7-inning gem. Stranding two runners in each of the first three innings, the Blue Devils finally broke through in the fourth. After a single by Brandon Green and a walk, Josh Schumacher singled in the game’s first run and Brigham Mooney’s sacrifice fly made it 2-0. An insurance run was added in the sixth. Brandon Still doubled with one out, moved up to third on Adam North’s single and scored on Schumacher’s ground ball. The Blue Devils were limited to seven hits including two each by Green and Schumacher. Five of Coffeyville’s first six runs scored without benefit of a hit as the Ravens never trailed in the 8-3 nightcap. Four Ravens who drew walks scored, two others crossed after errors. Coffeyville set the tone from the start, scoring two unearned runs in the first on a walk, two-base throwing error and wild pitch. KCKCC got one run back in the first. Schumacher led off with a triple and scored on Mooney’s ground ball. A towering home run into the wind by Connor Boyt, Coffeyville’s only hit the first four innings, made it 3-1 in the second. KCKCC got one run back in the fourth on a walk, single by Kevin Santiago and Rorey Combs’ RBI double and had the bases loaded with one out but a force out at home on an attempted squeeze bunt and a fly ball ended the threat. Coffeyville then closed things out by scoring a run in each of the final five innings starting with a bases-loaded walk that kayoed starter Victor Gotay in the fifth. A two-out infield error in the sixth and a dropped fly ball in the seventh stretched the Ravens’ lead to 6-2 before KCKCC scored its final run in the seventh on Brandon Still’s triple and a ground ball. Each team had just six hits with Combs the only Blue Devil with more than one. Gotay, who gave up only two hits but walked five and struck out five in 4.1 innings, took the loss. Allan Brown worked 3.2 innings, allowing three hits, one earned run, walking two and striking out five while Julian Rivera finished out, giving up one run on one hit and one walk.